Natural gas can help you conserve energy at your home or in your business. 30% of the energy used in a home goes toward heating. Energy-efficient and affordable heating can mean significant savings on your bills over the long term. Natural gas powered equipment costs half-as much to operate as those fuelded by electricity. Your cash-flow and overall operating costs are lower with natural gas. Natural gas is delivered direct to your home or business through underground pipelines and converted to energy when you use it. That makes it especially efficient. From the place where is is extracted from the ground to the appliances in your home or business, natural gas has very little energy loss with a 92% energy efficiency. Not so with electricity. Electricity is generated at a power plant. On the journey from production to the customer, electricity loses more than 66% of its usable energy before you even turn on an appliance. When you factor in energy use and emissions along the way, households with natural gas vs electric appliances produce 37% lower greenhouse gas emissions. 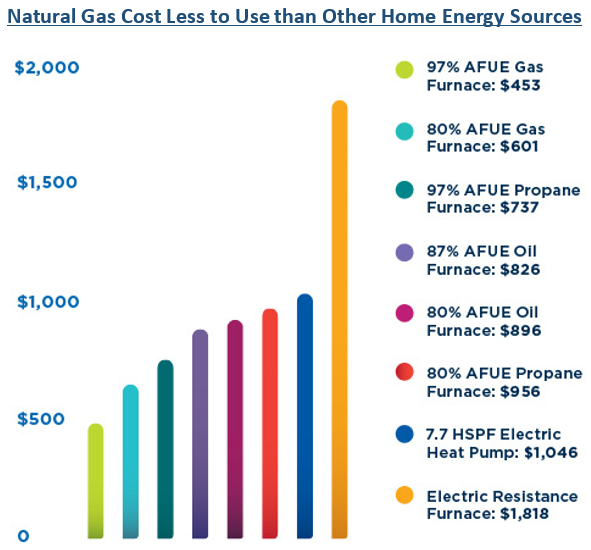 Natural gas equipment has a higher annual fuel utilization efficiency (AFUE) rating and that means greater savings than equipment powered by other energy sources.